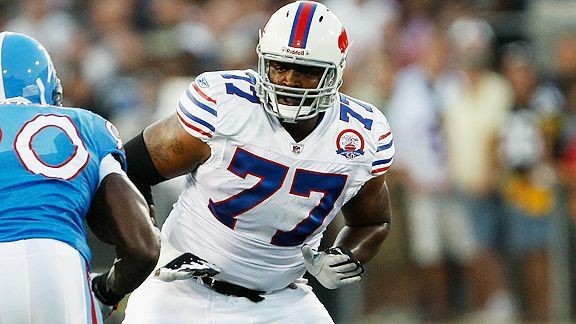 Free agent offensive tackle Demetrius Bell (6-5, 305) is visiting the Eagles this afternoon per a league source. With Pro Bowler Jason Peters out indefinitely with a torn Achilles' tendon, the Eagles have an opening for a tackle. Bell impressed the Eagles on their loss last season at Buffalo, stepping in for an injured starter. Bell visited the Pittsburgh Steelers Friday. Don't count Peters out in 2012. One of the most striking comments furnished by the Eagles in the wake of the serious Achilles' tendon injury sustained by Jason Peters is that the Pro Bowl offensive tackle hasn't been ruled out of action this season. Andy Reid suggested Peters - who undergoes surgery Tuesday - is on board with what could be a very aggressive rehab. With Peters out, Vick might have to scramble a bit more. The Eagles revealed that left tackle Jason Peters ruptured the Achilles' tendon in his right leg Tuesday while training in Texas. Surgery is scheduled for Tuesday by Dr. Steve Raikin of the Rothman Institute. The announcement came shortly after the Eagles signed veteran offensive lineman King Dunlap to a one-year contract. Though Dunlap is a reliable backup who can play either tackle position, the Eagles now must explore selecting an offensive lineman like Riley Reiff of Iowa with the15th overall pick in the first round of the NFL draft. 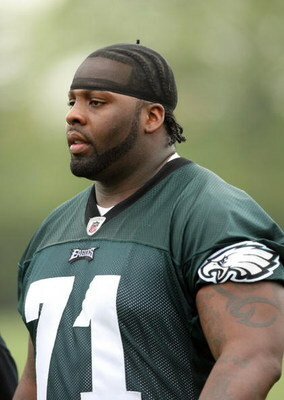 The Eagles signed veteran utility offensive lineman King Dunlap top a one-year contract. Dunlap (6-9, 330) had, played every position but center for the Eagles, appearing in 38 games with seven starts. Dunlap is a 2008 seventh round draft pick poor of Auburn. At 6-9, Dunlap joins Jonathan Ogden and Ben Jefferson as the tallest players ever to play guard in the NFL, according to Stats Inc.
Asante Samuel burned all of his bridges with the Eagles when he trashed team president Joe Banner last season. Samuel (R) tells LeSean McCoy not to trash Banner. It's going to be next to impossible to trade Samuel for much more than a bag of footballs. deal of Samuel to the Titans for a conditional third-round pick comical. Conditions? Maybe the Titans could pretend it's a third-round pick. If they feel like it, they could surrender a late seventh-round choice. Just don't tell anyone. There's your condition. Jim Wyatt of The Tennessean hits the nail on the head here breaking down the rumor. Later there was a rumor the Lions were interested in Samuel but not if he wanted them to honor his $9.9m contract for 2012. If Samuel is willing to redo his contract, he has interest in joining the Titans. If it's obvious he wants to join the Titans, why in the world would they give anything of value for him when it's fairly clear they could get him for virtually nothing? Samuel is more likely to be released than net the Eagles anything of value. That's what happens to players who question Banner. Samuel will be missed. There is no one in that Eagles locker room who has the nerve to speak his mind (although Nnamdi Asomugha has his moments). But Samuel is easily replaceable. Ronnie Brown still is looking for a job. All reasonable RB offers considered. That hasn't stopped the free agent running back from getting together with Eagles Youth Partnership to address bullying and youth violence in Philadelphia-area schools. Brown, who wore No. 23 for the Eagles, also showcases his “23 WAYS to Stop Youth Violence” effort. The programs are Thursday and Friday at Germantown High School. The U.S. Attorney’s Office, with Ronn Fletcher, City Year Greater Philadelphia, Teen Truth Live and Power 99 also weigh in on those issues. Salary cap increase could facilitate new contract for McCoy. Among the reasons the Eagles redid contracts and extended the deal of DeSean Jackson was what agents have said is a big bump in the salary cap in two years. The big spenders at least will get a chance to buy championships. Even the frugal teams can benefit in that they will be able to extend the contracts of more of their core players. In this theater the Eagles will make a push to make Pro Bowl running back LeSean McCoy part of what general manager Howie Roseman said was a plan to have some flexibility now and in the future. Reid wouldn't 'force close' Castillo. You couldn't get much crazier than the statement Andy Reid supposedly formulated Friday to refute a Los Angeles Times piece suggesting he would have walked away from the Eagles had he not gotten a greater say in personnel decisions. The sources cited by author Sam Farmer hit the nail right on the head. Reid's authority has diminished year after year while the influence of team president Joe Banner and general manager Howie Roseman has grown. Reid denied this in the statement. And trust me it was approved by Banner before the football media relations staff hit 'send' on the mass email. 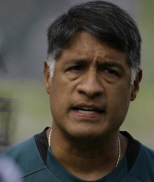 Trust me, the only reason Reid isn't the coach of the San Diego Chargers is the Eagles had NO PLAN B. Big Red was so infuriated over the criticism of his hire of Juan Castillo as defensive coordinator he called the bluff of Banner. Reid has total control over at least one thing - his coaching staff. If he was coming back, so was Castillo. If the Eagles had fired Big Red they would have owed him $11 million. Castillo still is the defensive coordinator. And Steve Spagnuolo, who is tight with Reid, wasn't interested in coming aboard as a defensive assistant. To give you an idea of what kind of mess the Eagles were internally, Spags passed up an offer from Reid to work for the New Orleans Saints, who basically have been suspended for the 2012 season because of their Bounty Bowl escapades. Give Reid credit for finally using what leverage he had. Reid likes often talks about being aggressive. Well, that's what he's been, only with Banner. 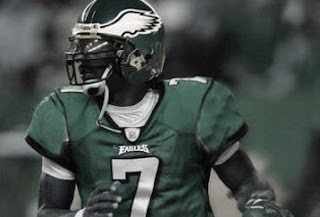 The Eagles saw opportunity, not red flags when they realized they would be able to land a guy who made two Pro Bowls before his injury for basically a fourth-round pick. Then again, if those cap problems the Texans are having are so acute, why didn’t the Birds just wait for Ryans to get released? Clearly they sensed there would be a bidding war for a guy they also would have to pay $5.8 million this season – the most, by the way, they’ve ever paid a middle linebacker. 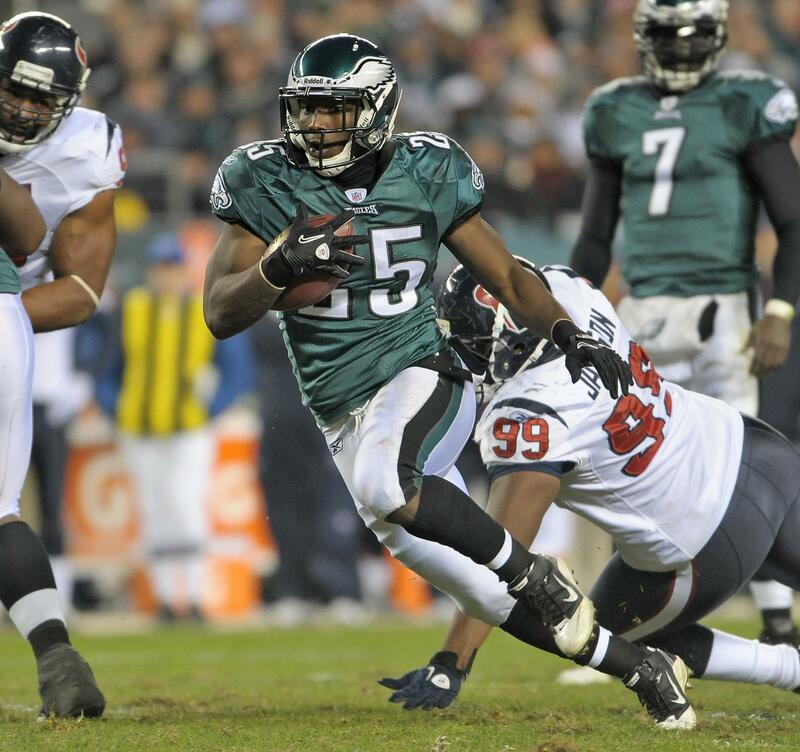 The way Eagles Nation has reacted, you would think DeMeco Ryans is headed to the Pro Football Hall of Fame. Then again, diehards have watched so many ordinary linebackers almost anyone with a couple of Pro Bowls on his resume is an immense improvement. Even, it seems, if those accolades came before a torn Achilles' tendon. More on that during the OTA's. At any rate, Ryans already has exhibited the 'it' factor. Just a quick talk with new teammates was enough to open eyes. The guy is a leader. And that's largely why the Eagles traded a fourth-round pick to the Texans to secure him. "Just going in there and shaking his hand you can see how confident he is," Eagles linebacker Brian Rolle said. "I look forward to playing next to him." It's OK to be excited. Especially after Barry Gardner, Levon Kirkland and, remember Mark Simoneau? First-round grade coming out of 'Bama. The Eagles made it official. 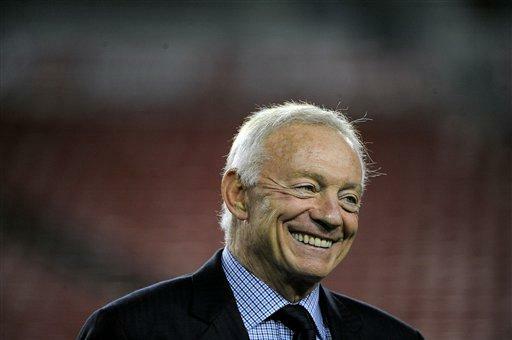 Yes, they agreed to trade undisclosed draft picks for a middle linebacker. 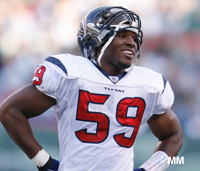 Not just any middle linebacker, but DeMeco Ryans (6-1, 247), who made the Pro Bowl twice before rupturing an Achilles' tendon. The Eagles agreed to give the Houston Texans a fourth-round pick for Ryans. They also swapped third-rounders, the Eagles getting the 87th overall pick, the Texans the 77th. And sure, Ryans is a linebacker who can tackle when he's healthy. Still, that injury should be reason to curb the enthusiasm a bit. Players tend not to be the same after tearing Achilles' tendons. There are more Todd Pinkstons who never were all the way back than Demaryious Thomas' (Broncos). If I'm missing a Hall of Famer, by all means, comment. Ryans must pass a physical on the Achilles he hurt in 2010 to consummate the deal. That said, I understand your pain. Hopefully the Eagles still will consider moving up the board in the first round to select middle linebacker Luke Kuechely of Boston College. There's room to park 50,000 cars in here. More on the way about Dan Connor, the two-time Delaware County Daily Times player of the year out of Strath Haven High School who recently signed a two-year contract with the Dallas Cowboys. Connor, you probably guessed by now, has taken some playful heat from friends for enlisting with the Cowboys. Just say he had mixed emotions taking the trip, but soon realized it was an opportunity he couldn't pass up in a free agent market full of inside linebackers. "It's kind of the business side of football," Connor said. "And I'm not real good at that side. I wanted to get it over with quick." Connor got it over with at an unusually good rate. I'm hearing the two-year deal is worth $7 million, a minor coup for the position this early in free agency. And remember Connor will be just 28 when the deal expires and he's eligible for free agency again. With DeSean Jackson’s deal done, the Eagles can turn their attention to Pro Bowl running back LeSean McCoy. Running back is entering last year of contract. It should be an interesting negotiation in that McCoy – like Jackson – is entering the final year of his rookie contract. Unlike Jackson, McCoy is coming off a career year in which he shattered the franchise record with 20 touchdowns, including 17 rushing. 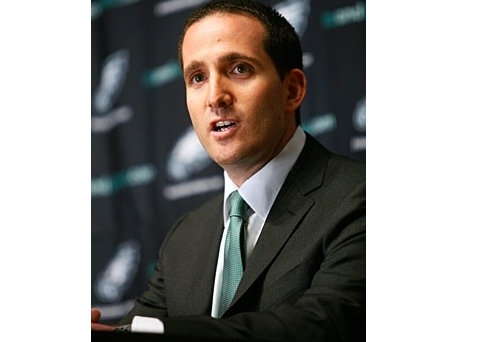 "I think we're looking at it for the next couple of years in terms of the cap situation that we have," Eagles GM Howie Roseman said. 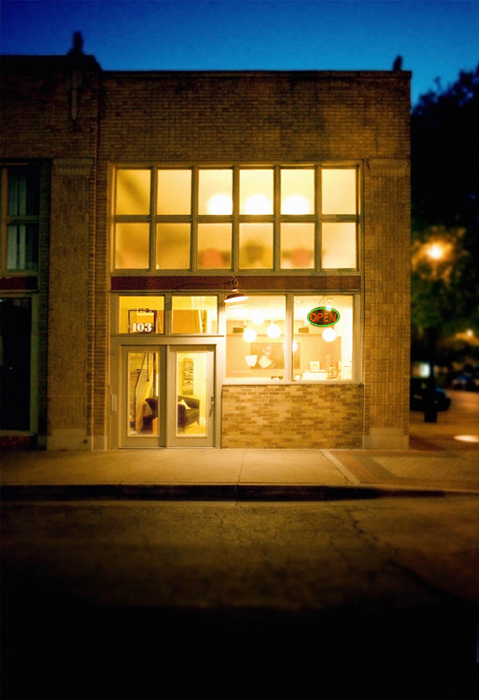 "And we're trying to have some flexibility now and in the future. LeSean McCoy is a great player and we'd like him to be in Philadelphia for a long time." Jackson offered insight into his decision to play out his contract. A rocky season cost him money although he netted a five-year contract worth $51 million, including $15 million guaranteed. The franchise tag for a running back this season – the average of the top five salaries at the position through the years - is $7.742 million. Think $45 million over five years for McCoy with at least - at least - $15 million guaranteed. 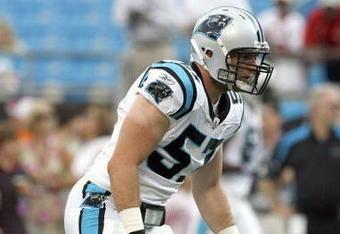 Dan Connor signed a two-year contract Thursday with the Dallas Cowboys. The two-time Delaware County Daily Times high school football player of the year reached agreement with the Cowboys in the afternoon. Though reports and tweets stated Connor would sign with the Eagles, those exaggerations were news to the veteran middle linebacker. 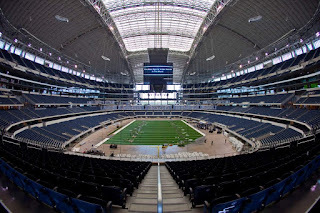 Connor was impressed with Cowboys owner Jerry Jones and impressed by the opulence of Cowboys Stadium, which cost $1 billion and change. The 26-year-old Connor likely will compete with Bruce Carter for a starting inside linebacker job with the Cowboys. Sean Lee, who teamed with Connor at Penn State, is the other inside linebacker. The Cowboys aren’t expected to bring back free agent linebackers Keith Brooking and Bradie James. Murray Street Coffee, Dallas, worth a try. Connor played all four of his NFL seasons with the Carolina Panthers, who selected him in the third round of the 2008 draft. He missed most of his rookie season with a torn ACL and two years ago, injured a hip. Wants Shady McCoy around "a long time." No dancing around the obvious. With DeSean Jackson signed to a five-year contract, running back LeSean McCoy, in the last year of his contract, is the Eagles' top priority. 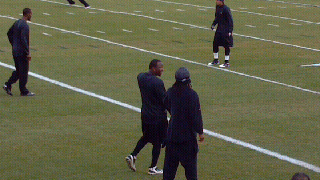 Shady McCoy with Asante Samuel, pregame. "I think we're looking at it for the next couple of years in terms of the cap situation that we have," Roseman said. "And we're trying to have some flexibility now and in the future. LeSean McCoy is a great player and we'd like him to be in Philadelphia for a long time." Roseman didn't seem to be in a hurry to add a linebacker in free agency. And he said the Eagles were in constant contact with the representatives for guard Evan Mathis, who visited the Ravens. The level of commitment isn't the same as for a superstar, which made Roseman grin. "Whatever it takes?" Roseman said rhetorically when asked about retaining Mathis. "That's a powerful statement. We'd like Evan back." And no, I wouldn't ask Roseman such a thing. HR gave me a non-answer at my inquiry about what, if any safeguards were in the 5-year, $51 million contract Jackson signed. "We have no questions about DeSean as a person or a player," Roseman said. "And I think his contract reflects that." 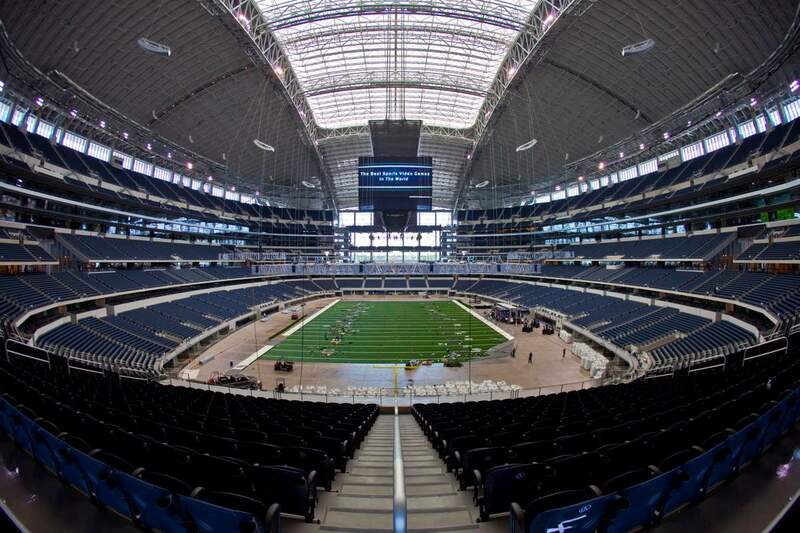 Dan Connor was awed just like anyone who gets a look at $1 billion Cowboys Stadium. The free agent middle linebacker's visit to Dallas went well Wednesday and will continue into Thursday. Connor met the irrepressible and - Eagles fans can vouch for this - very approachable Cowboys Jerry Jones. With all due respect, you can't help but feel impressed with a guy who wants to win as much as you do. The two-time Delaware County Daily Times Football Player of the year out of Strath Haven High has a major decision ahead. Exciting as it is to be wanted, Connor wasn't a big fan of being recruited in high school. It took him very little time to lock in early on Penn State and get his career started. NFL free agency is a little different. It's a much more bottom line process with owners, general managers, coaches, players, agents and lawyers involved. It's the kind of life-changing decision you wouldn't wish on a 26-year-old. It's also reality, and Connor is doing his best to deal with it. So far, so good. More Thursday. This was on Wikipedia before changes. Apparently it began when Buccaneers defensive tackle Gerald McCoy @geraldini93 tweeted that free agent linebacker Curtis Lofton was signing with the Eagles. McCoy later deleted the tweet.